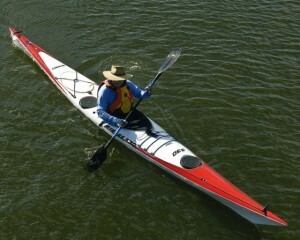 Most club members use ‘Sit In’ type sea or estuary kayaks, in preference to a ‘Sit On’ kayak. Kayaks for sale, often appear on the club website under Classifieds and through other websites. It is important however to be familiar with various kayak brands and what design would best suits the individuals. As kayaks need to be carried, it is important to consider the weight when making a new purchase, somewhere around 25kg is suitable. Kayaks should have ample waterproof storage to cater for morning-tea, personal items, safety gear.. Occasionally the club may have whole day or overnight paddles. Be well maintained with bulkheads or additional floatation to generate buoyancy. Be capable of keeping up with the group with a paddling speed of above 4 km per hour. Be seaworthy, as the weather can change, creating challenging paddling conditions. Carry a sponge/ bailer/ or pump, which is used to remove water from the cockpit. Wear aquatic footwear suitable for paddling, swimming and/or walking on rocks.